We are very excited to welcome local author Jo Piazza O’Mara back to the Nevins Library! She will be here to talk about SONGS IN THE NIGHT, a sequel to GARDEN OF HOPE. 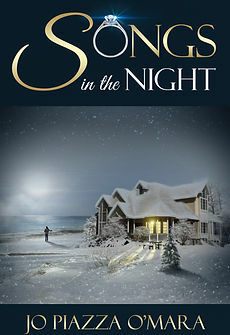 Songs in the Night , a sequel to Garden of Hope , continues to follow the lives of the gregarious, fun-loving Agosti family. Joe, now the patriarch of the family, prayerfully guides his sisters and their children as they weather multiple trials; trials that would test the family’s faith and their close bond. When accusations of a serious crime are made, when the story behind a mysterious ring is discovered and when a horrific car accident occurs – the family is shaken to its core. The legacy of faith from the grandparents to the third generation highlights God’s faithfulness and sovereignty. Songs in the Night is a story of testing, trials, and hope. A selection of the family’s treasured Italian recipes are included in the back of this book. Jo will have copies of her books available for purchase and signing. Refreshments will be served. To register for the program, please click here or call 978-686-4080 x16. Categories: Books, Christian Fiction | Tags: Agosti family, Christian Fiction, Garden of Hope, Jo Piazza O'Mara, Songs in the Night | Permalink. Author Jo Piazza O’Mara is coming to the Nevins Saturday April 11th! Please join us in welcoming author Jo Piazza O’Mara to the Nevins Memorial Library! She will be sharing her debut novel, Garden of Hope which is set in her hometown of Lawrence, Massachusetts! The event will begin at 1pm. Please register on our calendar of events if you are able to attend! Categories: Author Visit, Books, Christian Fiction | Tags: Garden of Hope, Jo Piazza O'Mara | Permalink.